The Monadnock Folklore Society presents the Peterborough, NH First Saturday Contra Dance on December 1, featuring Steve Zakon-Anderson calling with the band Stomp Rocket. Dance caller Steve Zakon-Anderson has been leading contra dances for over 25 years. He has performed at dance camps and festivals from Alaska to Florida. Steve’s clear teaching, precise calling, and sense of humor have made him a favorite of dancers of all ages and abilities. Music for the dance will be provided by Stomp Rocket. 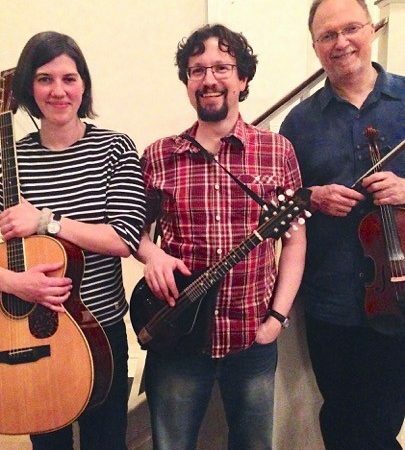 They are Dave Langford from Boston (fiddle), Glen Loper from Portland, ME (mandolin, banjo, percussion), and Bethany Waickman, also from Portland, ME (guitar).